Not to be confused with 3-Up Moon. A trio of Power Moons with a crown on top. Screenshot of a Multi Moon in the Sand Kingdom. Multi Moons are collectable items in Super Mario Odyssey. Equivalent to the Grand Stars in Super Mario Galaxy and Super Mario Galaxy 2, they are usually collected after completing a level with a boss (with the exception of Bowser) or another story-related mission. They count as three Power Moons when powering up the Odyssey, although they are only counted as one on the list of Moons in a kingdom. 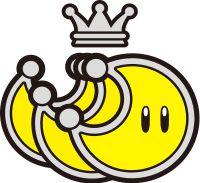 Like the Power Moons, the Multi Moons are given specific colors depending on the kingdom in which they are found. Collecting a Multi Moon will teleport Mario back to the Odyssey. Multi Moon Atop the Falls (Cascade Kingdom): Obtained from defeating Madame Broode. Showdown on the Inverted Pyramid (Sand Kingdom): Obtained from defeating Hariet. The Hole in the Desert (Sand Kingdom): Obtained from defeating Knucklotec. Broodals Over the Lake (Lake Kingdom): Obtained from defeating Rango. Flower Thieves of Sky Garden (Wooded Kingdom): Obtained from defeating Spewart. Defend the Secret Flower Field! (Wooded Kingdom): Obtained from defeating Torkdrift. New Donk City's Pest Problem (Metro Kingdom): Obtained from defeating Mechawiggler. A Traditional Festival! (Metro Kingdom): Obtained from completing the 2D section during the Festival and then talking to Pauline. The Bound Bowl Grand Prix (Snow Kingdom): Obtained from completing the Bound Bowl Grand Prix. The Glass Is Half Full! (Seaside Kingdom): Obtained from defeating Mollusque-Lanceur. Big Pot on the Volcano: Dive In! (Luncheon Kingdom): Obtained from capturing a slab of meat and having Cookatiel take it up to the pot on the top. Cookatiel Showdown! (Luncheon Kingdom): Obtained from defeating Cookatiel. Battle with the Lord of Lightning! (Ruined Kingdom): Obtained from defeating the Ruined Dragon. Showdown at Bowser's Castle (Bowser's Kingdom): Obtained from defeating the RoboBrood. Tussle in Tostarena: Rematch (Mushroom Kingdom): Obtained in a rematch with Knucklotec. Struggle in Steam Garden: Rematch (Mushroom Kingdom): Obtained in a rematch with Torkdrift. Dust-Up in New Donk City: Rematch (Mushroom Kingdom): Obtained in a rematch with Mechawiggler. Battle in Bubblaine: Rematch (Mushroom Kingdom): Obtained in a rematch with Mollusque-Laceur. Blowup at Mount Volbono: Rematch (Mushroom Kingdom): Obtained in a rematch with Cookatiel. Rumble in Crumbleden: Rematch (Mushroom Kingdom): Obtained in a rematch with the Ruined Dragon. Arrival at Rabbit Ridge! (Dark Side): Obtained after defeating all four Broodals and RoboBrood. Long Journey's End (Darker Side): Obtained after completing the final level and climbing to the top of the tower. Multi Moons feature a different color depending on the kingdom in which they are found. Their color also matches the color of the kingdom's Power Moons and the pole of the Kingdom's Checkpoint Flag. Like Power Moons, after they are collected, they lose their color and appear translucent the next time they are collected. The Multi Moons in the boss rematch paintings, Dark Side and Darker Side are the only ones that can be collected again. Mario and Cappy collecting a Multi Moon. Multi Moons were originally called Grand Moons during the E3 playthrough. White is the only Power Moon color to not represent a Multi Moon. Unlike normal Power Moons, the victory animation will still play if an already-grabbed Multi Moon is collected again. As of the version 1.2.0 update with Luigi's Balloon World added, the already-collected Multi Moon no longer appears in front of Mario and Cappy on the screen in the victory animation. ↑ Nintendo. (June 14, 2017). Super Mario Odyssey - Sand Kingdom & New Donk City Demonstration - Nintendo E3 2017. YouTube. Retrieved September 20, 2017. This page was last edited on February 20, 2019, at 15:57.